Real Self Defense for Kids and Adults! Street & bully proof your entire family with Krav Maga and Combat Jujitsu; the worlds 2 most effective and practical martial arts now combined! Fun weekly classes teach all ages how to be safe and what to do if attacked from standing, ground, multiple attackers, weapons and more! BUILD CONFIDENCE - IMPROVE FOCUS – KEEP FIT - ENHANCE GRADES! Learn year round in a fun and friendly environment with two award winning instructors (female & male) with over 25 years of experience teaching kids & adults. Both have multiple black belts, gold medals and have been chosen to teach street safety/self defense in high schools, corporate and government agencies. Much more than a traditional martial arts class, kids, men and women will learn the most current techniques and tactics to prevent an attack or defend yourself. Realistic street proofing and environmental training (in a park, car, outside, etc.). Classes feature Self defense for kids and adults that does not rely on size or strength and will work for all physical ability! ...You do not have to be in shape! We will work to get you there and everyone has the potential to defend themselves (we will teach you how). Combining the best of multiple arts (Krav Maga, Japanese / Brazilian jujitsu, Karate, Judo, etc. ), students learn the most effective self defense techniques. NO UNIFORM COSTS - NO INITIATION FEE - NO LONG TERM CONTRACTS! CITY CENTRE COMMUNITY CENTRE "KRAV-JITSU SELF DEFENSE"
Pick Monday, Wednesday OR Both (for extra practice). Registration is Separate For Monday and Wednesday Classes. KIDS CLASS (5-8 years): Monday 6:30-7:15pm. 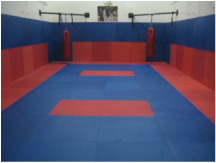 Facility: Large open floor with lots of space, striking pads, mats and natural light. Female & male change rooms with showers, water fountain, etc. MARTIAL ARTS STUDIO "KRAV MAGA SELF DEFENSE"
Facility: Fully matted floor with lots of space, equipment, striking bags, etc. UBC RECREATION MARTIAL ARTS STUDIO "Krav Maga Self Defense"
Mayor Malcolm Brodie & Honourable Member of Parliament Alice Wong; award Certificate of Appreciation to Hit and Run Self Defense at the Safe and Secure Living fair. 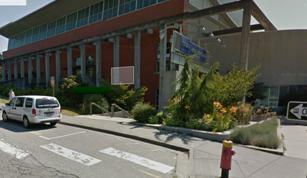 Richmond (Central) #105-5900 Minoru Blvd.